Signing up for a credit card involves a sense of responsibility, and understanding that it has the ability to influence your life both positively and negatively is key to using it properly. Believe it or not, canceling your credit card also takes some consideration, as depending on your situation, the negatives of canceling a particular credit card may outweigh the positives. In order to provide some clarification for the scenarios in which canceling a card is appropriate, we’ve put together a list of the four best reasons for taking the cash/debit route and ditching your credit cards. For those of you who have joint accounts, getting divorced or going through separation is hard enough without having to worry about your finances. Settling these accounts and closing them is the smart thing to do so that no debt accrued by the other former partner is associated with your name. There is no way to prevent this short of closing the account, and lenders will come after you just as much as your former partner if you share custody of the credit card account. In this case, playing it safe is the best thing you can do. 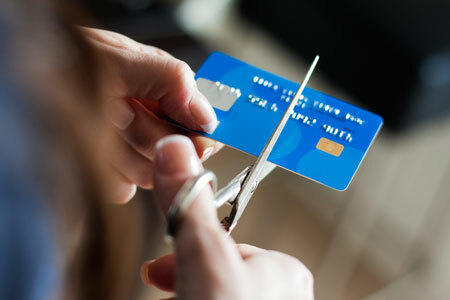 If in the event your credit cards have become too much to handle and you know the only way out is to end your access to credit, then canceling the cards makes sense. While canceling multiple credit cards simultaneously can have a negative impact on your credit score, it is a better option than accruing more debt that you will not be able to pay off. The resulting action of taking your credit card debt seriously will ultimately improve your credit score more than any temporary bump, and it should be noted that we recommend maintaining at least one line of credit for emergency situations – store it in a safety deposit box away from impulsive decisions. There is no negotiation in this situation: if your credit card account(s) has been compromised, you must cancel your credit card accounts. In some cases when your card is lost or stolen, credit card companies will completely close the account and issue you a new card. Sometimes, however, the account in question will remain active after the issuing of a new card. If you are being billed for monthly charges for services and products that you do not want or agreed to purchase, closing the account in question must be confirmed when calling the credit card company. Sometimes those shiny new credit cards become expensive burdens: for instance, the case of credit cards with no annual fees for two years, but afterwards you receive a bill in the mail for $100. It is always advised to discuss a waiving of the fee with the credit card company before making any decision, but canceling the card may be in order if you cannot get recourse. Generally speaking, though, if you pay your credit card bills on time, most companies will be glad to waive the fee at least once. Keep the Credit Card Accounts Open… really.